It’s true, like many of our campers and staff, that I am my happiest when I am at Camp. Of course, I love the lake and the sun and the shtick and the Judaism and the escape from the outside world. Most importantly, I love the people, the constant interactions, the noise, the camaraderie, the songs, the laughter, and the relationships. I yearn for it all year round. Don’t get me wrong, I have the most amazing family, friends, and co-workers whose company I value and enjoy tremendously. But, in Milwaukee, in my real-world, I can’t seem to put down my phone or close my computer. Truth is that at Camp, we are experts at this! And, I’m ready to perfect it in real life; you should be too! 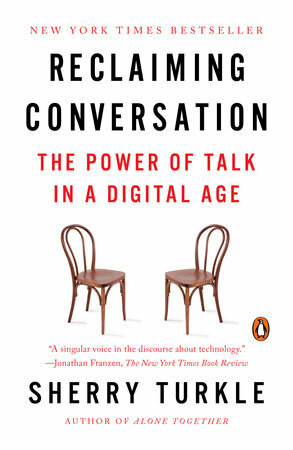 After learning about it at a conference, I just read the book “Reclaiming Conversation: The Power of Talk in a Digital Age” by Sherry Turkle, and it scared me. She really talks about something that we all know about already: technology is ruining in-person communication – mostly our ability to be empathetic. This isn’t new information. However, she presented it in a way that really made me think about ME, about my person to person communication (or lack thereof), and about how my behaviors are impacting my children and their communication in the future. Sherry talks about the smartphone, and how it has impacted both our desire and our ability to have face to face conversations because we favor texting or email (or even Snapchat or a Finsta – if you don’t know what that is, let’s have a different conversation). 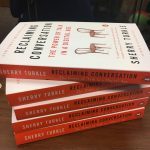 She acknowledges that there are appropriate times that texting or emailing can improve efficiency, but she’s worried that we are too focused on conversations that we can edit, control and reflect back on instead of live, raw, face to face connections. She ponders if we’ve lost the ability to daydream, to be creative, or to just sit and wait patiently? Our phones are always in our hands to fill that empty space with something to do. How do we even role model and display proper empathy when we can’t make eye contact, be active listeners or even attend fully to someone when we’re so concerned about what’s happening on our phones? Sherry talks about the workplace resembling that of a cockpit. Sometimes we turn on our screens, put on noise-canceling headphones, and drown out the rest of the world. The irony of this picture is that we do this not because we want to isolate ourselves and be alone, but because we are terrified of being alone! The smartphone allows us to have this perception and a false sense of security that we’re never alone. At Camp, we are a screen-free zone. And, it’s hard for many of our campers to part with their technology. Even our staff, who do have access to their phones during their time off, struggle with the detachment from constantly having their phones to only having access during limited times. Our camp community adjusts quickly because they were hungrier than they knew for interaction. We play games together at Camp. We make up songs and shtick together. We share jokes, moments and feelings without distraction from our phones. We are so lucky! We are able to teach real things to our campers when we have their undivided attention. We teach empathy and conflict resolution. We learn how to live Jewishly. We help campers refocus on journaling with a pen and paper rather than creating perfectly crafted status messages and photos. We teach campers that it’s ok to cry, it’s ok to feel lonely, it’s ok to feel vulnerable, and it’s ok to have a bad day or a bad moment. Even though they don’t always get a glimpse into everybody else’s pit or thorn when everybody else writes perfectly happy status updates, the bad stuff exists– for everyone – no matter how perfect their life looks on social media. Camp is important; disconnecting is important. I am so thrilled that I get to be a part of what I think is the most important education that our teens and our campers can possibly get. That leads to the next steps. How do we continue this at home? Our campers and staff (myself included) leave Camp and get right back to their technology and their “half-in” conversations. At my house, phones are not allowed to be on the dinner table or even during our bedtime rituals. At work, I often pick up the phone to respond to someone’s email. I may even take a walk around the JCC to respond in person. But, it’s not enough; I can do better than that, right? We all can. I am looking out to you, to my community, my village, to help me do better. I so desperately want to reclaim my conversations, and I want to (need to) role model this for my children and for all the children in my village. 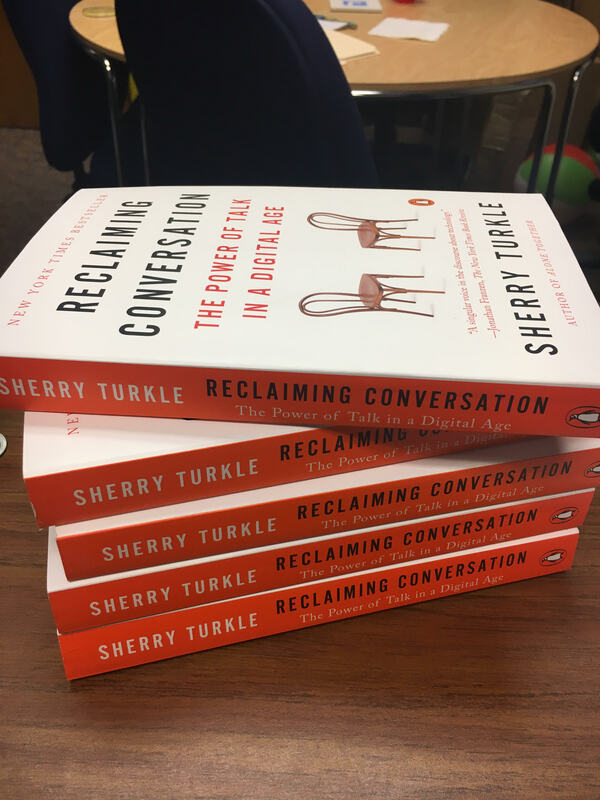 I have 5 copies of Reclaiming Conversation to give away! What are some things that you do in your homes, with your family, at work, or with your friends to connect, converse, share and feel? Be one of the first five people to respond to me with your suggestions, and I will send you a copy! You can post suggestions at www.facebook.com/interlakenjcc or email to me at tdavison@jccmilwaukee.org.